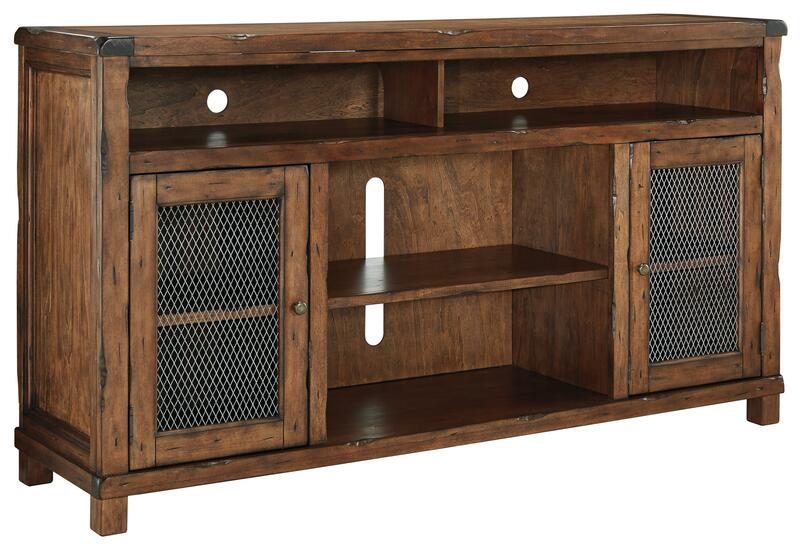 Made with mango veneers and select hardwood solids in a medium rustic finish, this extra large TV stand accommodates TVs up to 75" and offers a thick bread board like top with solid wood edges and chisel gouged details for distressed character. Diamond pattern wire mesh adds a hint of industrial style to the door and offers a view through to your accents on the two shelves inside. The top compartment for electronics can even accommodate a sound bar. The Tamonie Rustic Mango Veneer XL TV Stand with Wire Mesh Doors by Signature Design by Ashley at Michael's Furniture Warehouse in the San Fernando & Los Angeles area. Product availability may vary. Contact us for the most current availability on this product. Storage Top opening with divider 66.50" x 16.75" x 6.13". Door opening (2) 15.25" x 16.75" x 23.63". Center opening 30.13" x 17.00" x 23.63". 1 fixed shelf and 1 adjustable shelf in center compartment. 2 shelves inside each door.